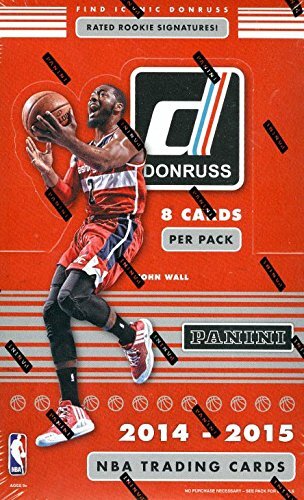 2014/15 Panini Donruss Basketball 24 Packs Per Box with 8 Cards Per PackBOX BREAK - 3 Autographs or Memorabilia Cards, - 3 Parallel Cards - 24 Metalized Cards - 48 inserts PRODUCT HIGHLIGHTS - Donruss returns to basketball for the first time since 2010! - The iconic Donruss Rated Rookie Card is back! Chase players like Andrew Wiggins, Jabari Parker, and Dante Exum. - Find all-new autograph content in Timeless Treasures Jersey Autographs, Signature Stars, and Elite Dominators Autographs - Look for the debut of classic Donruss designs in Basketball! - All-new inserts and parallels features unique sequential numbering to career and statistical player highlights.